TEL AVIV – Israel now has the worst traffic in the OECD, thanks in part to a tax which has helped reduce the countries reliance on highly polluting cars. According to new information released by the Organisation for Economic Cooperation and Development (OECD) over the weekend, taxes levied on cars sales in Israel have seen a dramatic shift in consumer preference towards low-pollution vehicles, but has also resulted in much greater traffic congestion. In 2009 Israel implemented a policy of taxing car sales based on each car’s emissions levels of five different pollutants. 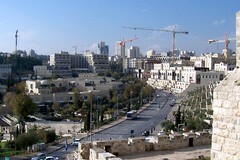 At the time of implementation the least polluting cars in Israel accounted for 19 percent of all sales in the country. TEL AVIV – Scooters and motorbikes in Israel will slash taxes on scooters from 40 percent to 25 percent in an effort to reduce traffic jams. The Finance Minister of Israel Moshe Kahlon announced that the taxes on small motorbikes would be decreased, in an effort to cut congestion and emissions. Until June 30th 2017 the tax on the sale of small motorbikes will be reduced from 40 percent to 25 percent. In order to fall within the scope of the tax cut, the motorbike must be less than 125cc and be rated at less than 11 kilowatts. It is believed that the reduction in the price of small motorbikes will lead to a greater uptake by people, ultimately leading to reduced emissions levels and reduced congestion in urban areas.